Fire crews on the scene of a fatal fire in Des Moines. 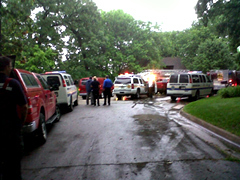 Fire crews were called to a home in northwest Des Moines about five o’clock this morning. In the process of attacking the flames, Fire Captain Steve Brown says the firefighters made a discovery. Officials say the woman found inside was 54-year-old Melanie Sheldahl who lived in the home. An autopsy is planned. Brown says smoke detectors were sounding inside the home when the first fire truck arrived and a neighbor called 911. Brown says the fire appears to have started in the kitchen, but he couldn’t specify. “Just in the general kitchen area,” Brown says. “There’s quite a bit of damage in there right now so they’re reconstructing to see exactly where that fire started.” He says the fire does not appear to be suspicious in nature.